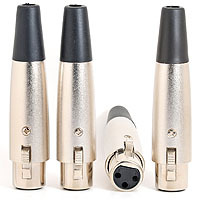 Neutrik NC3MXX Male XLR 3 Pin Plugs - Balanced Audio or Microphone Connectors Professional quality male XLR connector, which can accept cables up to 8mm diameter. It has silver plated contacts, a rubber cable boot to prevent wear plus internal cable grip and solder buckets. Item code: NC3MXX. 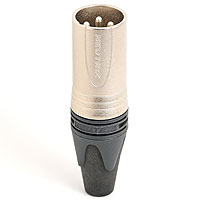 Female 3 Pin XLR Socket - Quality Microphone Plug or Balanced Audio Connector All metal female XLR connector which can be used as a replacement microphone plug or for balanced audio applications. It has a rubber cable boot to prevent wear plus internal cable grip and solder buckets. Item code: XLRSOC01.